Hmm, I'm rusty on my TMiL lore ^^. But, he is in XR now, isn't he? So why would Albatros scrap it? 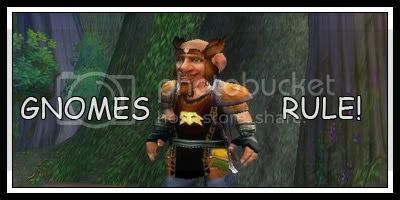 I dunno man, if the attack gnome is scrapped, I just might go on strike. I believe that that very passage was one of the greatest cliffhangers I have ever read. And one of the funniest. ahhh, its so awesome I cant handle it! Im gonna OD and freakin die and itll be totally worth it. �Yup,� said the gnome. He screeched in imitation.� ----> Missing a quote after 'gnome'. Hooray, that's all I found . Good to see Matt the Gnome again and happy birthday! Yay! Mulgore! And Matt the Gnome! I didn't think I'd actually miss him until he showed up. Ajax sure seems to be "scandalized" a lot Not that it's a bad term or anything...very appropriate for cats, methinks. Ahh, the namesake chapter of the part... Love it. I remember when this chapter was originally released oh so long ago. This has been a nice trip down memory road. This whole week worth of new TMIL-stuff makes it feel like its my birthday...every day! Take that back, this week has already been better than any birthday of mine. Thanks, Alby! Not to mention I can't figure out what crazy flightpath they are taking that they would fly from Mulgore to elfland and somehow pass over Feralas (Ashenvale wasn't mentioned, and maybe you meant felwood, one of the two me thinks). Now I could accept they went south then west then up the coast or something except that they fly near (not over hehe) moonglade. I dont get what you guys were always saying, back when he was writing the story the first time, I read that part and knew it was Ashenvale. I haven't gotten to that part yet in the new one, since I only recently started reading the rewrite. *waves little flag around* Woooo, it's over! Now to the new stuff! Wow, reading up on the rewrite will be a lot of...well, reading...and fun...and I just can't wait for a brandnew chapter! !